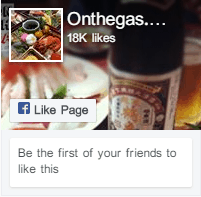 (Updated Apr 2019) –Wusthof has a reputation. Not the kind of reputation that is looked down upon either – these guys make some great solid knives that are worthy of not only commercial kitchens but also the home chef that loves to cook. 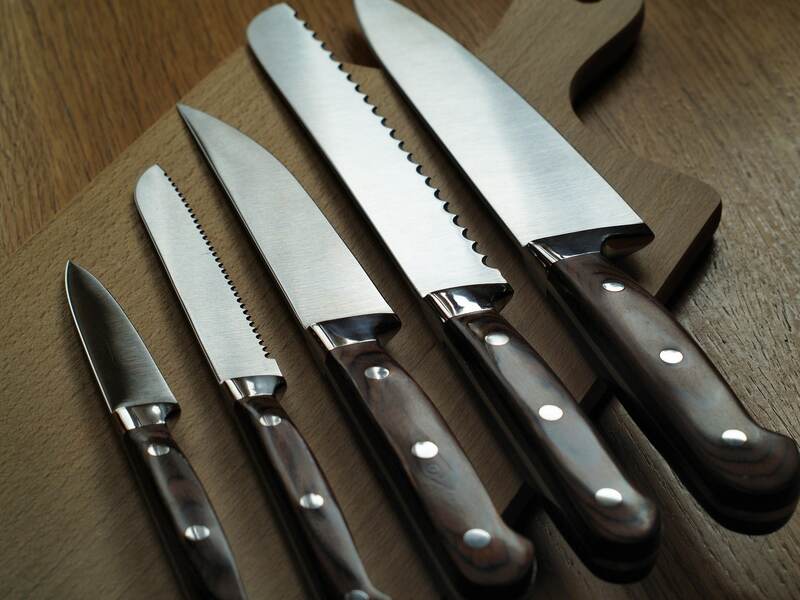 Having a Wusthof Classic Knife Set is having some serious gastronomical weaponry at your disposal. Each knife is precision forged from a single piece of high-carbon stainless steel and has a full tang. (For those that do not know, a full tang extends to the full-length of the grip portion of the handle, whereas a partial tang doesn’t). Made in Solingen, Germany, (the cutlery capital of the world) each knife comes with a triple-riveted synthetic handle and has a laser-tested edge for uniform cutting and long-lasting sharp edges. What’s even better is that all of these sets are on Amazon and are currently available… Let’s have a look at the top 5 sets. Great for someone who needs to get just two really good knives as a starter pack for the kitchen. It’s perfect as a present for an apprentice chef or someone who takes their cooking seriously. It covers all of your basic knives and is perfect for the young couple or smaller family living in an apartment. This set is suitable for a food-infatuated couple that doesn’t mind the odd steak knife and having some friends over for dinner. Great if you have a LARGE family (or small army) and you want to get the kids involved in cooking. This set consists of an 8-inch Chef’s knife and a 3.5 inch pointed tip paring knife. These knives are made from high carbon stainless steel and have full tangs – perfect for someone who needs to throw out all of their blunt garbage kicking around the drawers and get two really good knives. Are your kids leaving home? Does your mother have the worst kitchen knives on the planet – these two knives are really all you will ever need. You may want to add on a bread knife and a good solid steel to keep these puppies sharp. For anyone looking for chef’s knives or a reliable paring knife, this set is the way to go. Whether you are a home cooking enthusiast, a culinary student or someone who really enjoys whipping something up in the kitchen, this set will amaze you. The knives, crafted from the highest quality of materials combined with Wusthof’s amazing manufacturing skills, are designed to last through the ages. Most people prefer the size of these knives owing to how functional and versatile they are. You might see the price tags on budget knives and wonder why you should spend the extra bucks on these knives. In the end, it is worth it owing to the impeccable qualities in this set as you will see. An 8-inch cook’s knife that falls in the Wusthof classic line: This knife has a straight edge blade which is quite versatile in that it allows you to perform a range of activities with ease. Many people look at it as a chef’s knife. However, you are free to call it as you wish, especially since you can do away with your previous main knife. A 3.5-inch paring knife: Many people often refer to these kinds of knives as granny knives. Other than this name, they also go by peeling knife and clip-point paring knife. You can use them for a number of uses. However, make no mistake. The 8-inch knife is your main helper in the kitchen and the paring knife is here to help you move things along. If you don’t know yet, Wusthof has quite a reputation when it comes to the manufacture of the sharpest blades in the industry. In fact, they have won prizes they can attribute to the hand-honing and forging skills that they use in designing the incredible sharp edges that are characteristic of their products. As such, you will find that both the knives in this set boast of high-carbon steel bodies with a full tang. On top of these features, the knives have precision bolsters and polymer handles. They are also reinforced with vanadium and molybdenum for maximum toughness, hardness, corrosion avoidance and resistance to wear. All these factors combine to ensure that the user enjoys heft, strength, balance and durability. You will not be shopping for another knife in this lifetime. That is of course with the exception of adding another Wusthof knife set to your collection over time. Ok – this is the kicker for me. I am actually a bit of a knife snob and for me personally this Wusthof Classic 6 – Piece Chef set is the duck’s nuts. It includes a 4-inch parer, a 5-inch boning knife, a 9-inch carving knife, an 8-inch bread knife, a solid 8-inch chef’s knife all made of good solid steel. Consisting of a 3-1/2-inch paring knife, a 6-inch utility knife, an 8-inch bread knife, an 8-inch cook’s knife, a 9-inch honing steel, a set of banging kitchen shears, and a 13-slot storage block this Wusthof classic knife set is great for the top of the kitchen bench. basic knives a 3-1/2-inch paring knife, a 6-inch utility knife, an 8-inch carving knife, an 8-inch bread knife, and an 8-inch cook’s knife. But wait – there’s more – the steak knives! This set also includes 4 4-1/2-inch steak knives, a 9-inch honing steel, a set of kitchen shears, and a good solid storage block. This set is suitable for a food-infatuated couple that doesn’t mind the odd steak and having some friends over for dinner. You can also get more steak knives separately if needed. Like the other wonderful pieces, we’ve looked at, you get the same hand-forged blades that are crafted from a single piece of steel, making them retain their sharpness longer, and easier to sharpen when it is time to do so. ridiculous but hey, who says ridiculous isn’t great? This Wusthof Classic 26- piece Block Knife Set is massive. Featuring a 5-, 6-, 8- and 10-inch cook’s knife; a 2-3/4-inch peeling knife; 3-1/2-inch paring knife; 4-1/2-inch utility knife; a 5-inch tomato knife, a 5-inch boning knife; a 9-inch bread knife; a 6-inch sandwich knife; a 7-inch flexible filleting knife; an 8-inch carving knife; a 6-inch cleaver, eight steak knives, a sharpening steel, a set of kitchen shears and a 25-slot oak block – you seriously need to love cooking to be able to use all of these. Great if you have a LARGE family (or small army) and you want to get the kids involved in cooking. The only thing missing from this knife set is a ninja sword. People often do not pay attention to the way in which they handle their knives. Maybe it is because they think that knives are quite sturdy, and that no harm can come to them. It could also be that people view them as utensils that should not take up much of their time when cleaning. However, these notions are wrong, and it is best to take care of your knives when cleaning as a way of preserving their durability and protecting yourself. Are knives really dishwasher safe? Most manufacturers will let on that their knives are dishwasher safe and for this reason, many people will throw caution to the wind when it comes to cleaning their knives. However, when you are spending as much money as you are on knife sets, you must protect your investment. Once your knives are in the dishwasher, their protection is out of your hands. As such, they can undergo damage through getting nicked and banged against other dishes. What’s more, dishwashing detergents are pretty harsh on knife blades, and this can have a very unappealing aesthetic effect on your beloved cutlery. The high heat in the dishwasher does not do your knives any good either, and the result is that the dull blades that no longer have the allure they once held when new. Another popular cleaning method involves soaking the knives in hot water in preparation for washing. Most people think that this helps in getting the food particles off the blades faster, but it could not be further from the truth. Instead of loosening the residue, the food particles get more embedded on the blades, and this is quite unhygienic. What’s more, dulling of the blades occurs after continued use of this method. It is not uncommon for one to nick themselves when trying to retrieve the soaked knives from the hot water which is quite an unpleasant feeling. You probably think that giving your knives some time to dry by leaving them on a towel is a good thing. However, this only increases their chances of getting rust. The best thing to do is to dry them immediately after cleaning as there will be no avenue for corrosion. You should note that carbon steel knives tend to require much more maintenance than is the case for stainless steel knives. However, this is not to say that you should neglect one kind over the other as both can rust over time when proper care instructions are not followed. 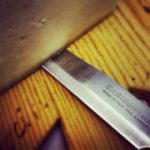 If you find that your Wusthof knife has a rust spot, you need not break a sweat as there are many ways in which you can use to fix this. The best means, in this case, would be to make baking soda slurry which you would then apply to the spot and start rubbing it into make this solution, you simply mix a good amount of baking soda and water into a bowl. Your goal is to make a paste-like solution you can use for cleaning. You can even add some lemon juice to the solution as well. Keep rubbing for a few seconds as if you are polishing the blade. You can use a toothbrush if the rust is not too severe. Then, proceed to rinse and dry the blade. Ensure that you dry the blade completely to avoid another corrosion situation. There is another option when it comes to dealing with rust. Soak the spotty blade in mild vinegar for a short while before rinsing it off and drying the knife. You will not want to exceed five minutes if you choose to use this method. If you tend to be forgetful, it is best to go with the baking soda option, or set a timer, as the last thing that you want is to leave the knives in an acidic solution for too long. In short, the best way to deal with corrosion is to avoid it by caring for your knives from the moment you take them out of their box. Now that we have covered the don’ts, we can get down to the best way to clean your knives. 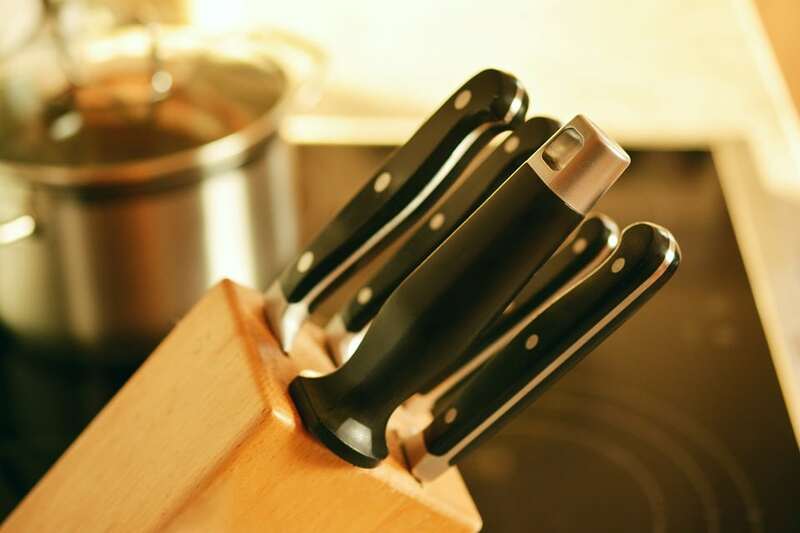 Immediately after you finish using the knives, take them to the sink and proceed to wash them with warm soapy water. Ensure that you use a soft dishwashing liquid and rinse all of the soap off before drying the blades with a towel. 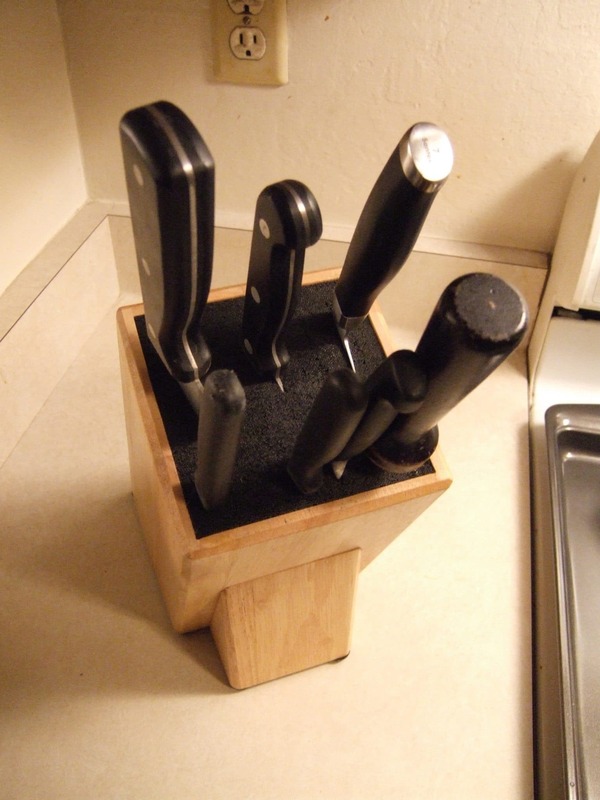 From here, keep the knives in storage to ensure that they remain sanitary before your next use. Through this simple method, you can avoid another trip to the store owing to damage. People prefer straight edges over hollow and serrated edges for one main reason, that being flexibility regarding usage. You can use these knives to handle almost all of your kitchen tasks with ease, and that is what makes them a favorite. The straight edge allows you to cut through items without tearing the fibers therein. As such, whether you are cutting fruit, meats or vegetables, you can be assured that the resulting slices will be even. It is no secret that Wusthof manufacturers put their heart and soul in the process and this is evident from the fantastic knives that they produce. The full tang, forged blades boast of polymer handles. They also undergo sharpening through the PEtec process which ensures that they slice through items with ease. As long as you practice proper care, your knives should be in excellent condition even with continued use. It is quite easy to get tired when using a knife, and this owes to the lack of balance. With Wusthof knives, you can say goodbye to such instances by way of the ergonomic handle, and perfect balance ensures that you do not strain your hands while cutting into items. As such, you can spend an entire afternoon in the kitchen chopping vegetables, and you would not feel a thing in your arm the next day. This balance also ensures that you find it easy when slicing into items and you need not use much energy in doing so. One thing that you will notice about most knives is that they allow liquids to seep into the handle. Over time, these residues make the knives unhygienic for use in the kitchen, and you will often find yourself getting rid of knives regularly, which is quite tough on your pocketbook. Thanks to the high-quality construction in play when it comes to Wusthof knives, you need not worry about food particles getting into the handle. As such, you can look forward to using clean knives for every meal. Having a dull blade can be very frustrating. Not only does it make the cutting of food much harder than it ought to be, but it also puts you at risk of getting cut if the knife slides off. The best way to sharpen your knife would be through the use of a whetstone. You start by cleaning the blades to get rid of any residue using the method described in the cleaning process. Afterward, dry them with a dishcloth and keep them in a safe place. Next, soak the whetstone in water for at least ten minutes such that the air inside the stone can get out. If you get a high-grade stone, you can skip this step as they will not have any air in them. To test the readiness of the whetstone, proceed to wet it and if any bubbles come out, soak it again. Place the stone on a wet paper towel or cloth once all the air gets removed. Hold one face of the blade over the stone such that it is hovering before brushing the knife against the whetting stone at a 20-degree angle. Slide the blade back and forth until the face is sharp before turning to the other face and repeating this action. Ensure that you do not cut into the stone while doing so. Sharpening your knives once every few months should do the trick. 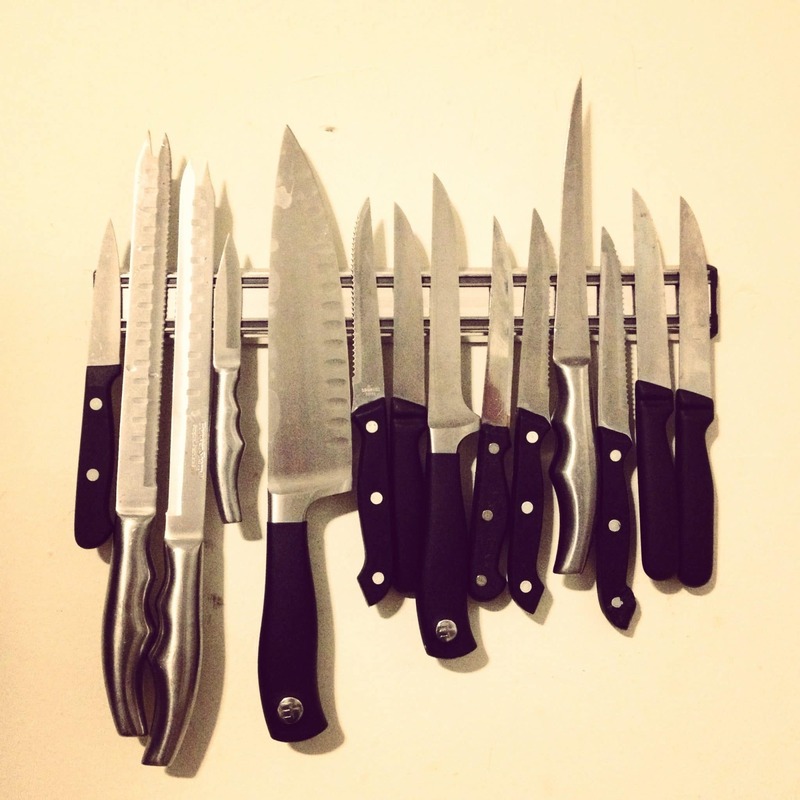 However, if you tend to use your knives regularly, you should consider sharpening them much more frequently. You should also make a point to avoid harsh detergents when cleaning your knives as this dulls blades. With proper care practices in place, you should enjoy using your Wusthof classic knife sets for years, as will the generations after you. 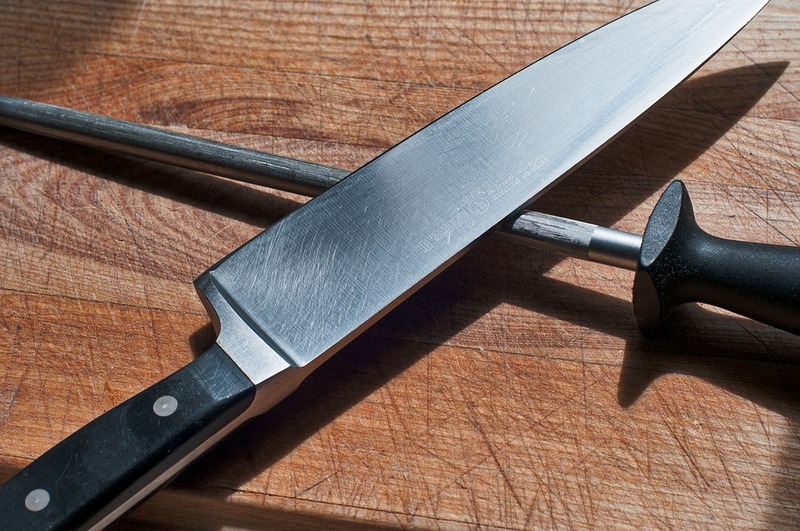 German vs Japanese Knives: Who Makes The Best Chef’s Knives? Lost track of how old some of my beautiful Wusthof knives are – used nearly every day. Loved more the longer you are lucky enough to have them! Hey guys, awesome website! Tempted to buy a new knief set, but may try to sharpen some of my old ones first – can buy the Wusthof knife sharpener seperately? Hi Peter – yes you can pick up the knife sharpener separately – but we would recommend a (good quality) sharpening steel or stone as opposed to a ‘knife sharpener’ – What kind of knives do you have now ? Thank you for your quick reply – It’s a wild collection of knives, there is one Wursthof, but also some IKEAa and a few artisan ones I bought from the local farmers market. Do yourself a favour – get rid of all the junk – and get a good set together – you only need to start with one good knife, and it sounds like you already have that … what size/ kind of Wusthof do you have ? Yeah – that’s a big knife .. but good … honestly pretty much all you need but maybe a bit too big – to sharpen it take it to a knife sharpener and get it done properly – then get yourself a good solid steel – find a video on youtube to show you how to keep an edge on it and just give it a once or twice over after each use.. keep it on a magnet or wrap in in a tea towel if it is in your drawer – next on your list should be something a bit smaller and easier to work with – I would go with an 8 inch or a 10 inch cooks knife …. then a pairing knife and maybe a bread knife and that is all you really need ! I’ve got a classic cook’s knife, 32 cm.